Yoga therapy can be a great part of your treatment plan to recover from injuries. Having a yoga instructor come to you for private lessons in the comfort of your home is very convenient and makes the process much easier. Your yoga instructor can customize a program for you that is appropriate for you based on your injuries and skill level. Yoga therapy is becoming a more recognized and accepted type of therapy. It is a type of therapy that uses yoga postures, breathing exercises and could also include guided imagery and meditation to improve physical and mental health. Yoga therapy is a holistic approach to healing, meaning the mind and body connection is taken into consideration. For example, with chronic pain, it is known that there is a connection between pain and mood. You and your yoga instructor can develop a program that works best for you. Yoga therapy can also be used as part of self-care plan, or as part of a plan of treatment for psychological issues such as anxiety or depression to help with stress relief and relaxation as it has benefits with respect to stress reduction. One size does not fit all when it comes to yoga therapy, which is why it is important, and beneficial to have individual and one-on-one lessons with a qualified instructor to make sure you have the right program in place. Melanie Schorr has taught specialized one-on-one sessions with people who have been injured. 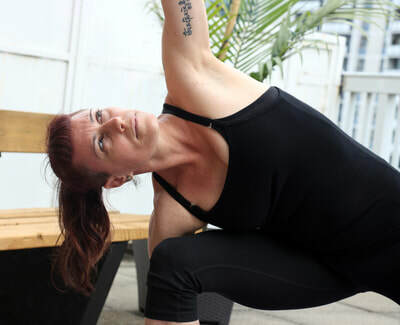 Having used yoga as part of her plan to heal her own body, Melanie understands the benefits of yoga as a form of therapy, after her physiotherapist recommended it to her after her car accident. She has a wide array of knowledge when it comes to anatomy and the practice of yoga for injuries.